A review of The Development of Dialectic and Argumentation Theory in Post-classical Islamic Intellectual History, by Mehmet Kadri Karabela. Mehmet Karabela’s dissertation is an example of the type of work that the best Islamic Studies doctoral programmes are producing. His thesis is based on a deep knowledge of the textual tradition that sits comfortably alongside confident familiarity with intellectual history and theory from outside the Islamic tradition, a willingness to find and edit hitherto undiscovered manuscripts, and a commitment to critical engagement with previous scholarship. Karabela takes the post-classical phenomenon of ādāb al-baḥth (general argumentation theory) and places it in the context of the broader dynamics of argument, dialectic, and demonstration that run through Islamic, and European, intellectual history. His core contribution to our field is the analysis of texts on ādāb al-baḥth by Samarqandī (13th century), ʿAḍud ad-Dīn al-Ījī (d. 1355), Sayyid Sharīf al-Jurjānī (d. 1413), Taşköprüzâde (d. 1561), Saçaklızâde (d. 1737), and Gelenbevî (d. 1791). His analysis reveals, for the first time in European-language scholarship, a discourse on truth and method that is worthy of sustained attention. Karabela is well aware, and again this is characteristic of recent work in Islamic Studies, that his chronological focus on the later centuries of Islamic intellectual civilization is helping to redress the imbalance by which European-language scholarship has historically focussed on a classical golden age between the ninth and twelfth centuries to the exclusion, and detriment, of vast swathes of intellectual production and creative thought that occurred later. And yet he does more than just bring new knowledge to the table. Some of the most interesting and rewarding passages of the dissertation are the result of his original readings of, for example, the structural similarities and differences between the Latin ars disputandi and ars obligatoria (pp. 225f), Goethe’s approving conversations about “Mohammedan” philosophical pedagogical technique (pp. 237f), or whether Ibn Rushd (Averroes, d. 1198) was a jurist, a philosopher, or both (p. 59). In addition to redressing the balance, Karabela makes a further persuasive argument that we actually need to move beyond the narratives of “decline” versus “anti-decline” (pp. 4-7). His argument is reflected in the practice of his research: he moves seamlessly through the centuries from Aristotle’s Topics to eighteenth-century Ottomans and he reads the ādāb al-baḥth tradition as a conversation across time and space while at the same time tracking the changing reference and purpose of terminology (p. 9). This sensitivity to context is another of Karabela’s achievements; he consistently ties intellectual history into social and political context, a difficult task and one often abandoned in works of this scale on the history of ideas. Tracking terminology across centuries and continents also forces Karabela to test and maintain his commitment to engagement with all relevant disciplines of knowledge: theology, poetics, grammar, philosophy, and jurisprudence. The ability to deal with this range of genres was commonplace in the culture under investigation and is often sadly lacking today. Karabela shows how it can be done. Karabela begins his thesis with a key binary: dialectic is “a practice of arguing with others (or with an opponent) aiming at victory rather than testing the validity of inferences, which is the territory of logic” (p. 16). This dialectical argumentative practice is key to understanding the first several centuries of the new Islamic civilization; he substitutes John Wansborough’s “sectarian” to call the “classical” context a “dialectical milieu” (p. 34). Dialectic was furthermore inseparable from politics (pp. 36-39, 48f). Karabela’s first chapter on “The Formation of an Argumentative Discourse” reviews the Greek into Arabic translation movement with particular reference to Aristotle’s Topics, and engages with the exemplary tale of Ḥayy Ibn Yaqẓān. His second chapter deals with the “Diffusion of Argumentative Discourse” across theologians, poets, grammarians, philosophers, and jurists. The discussion of inter-faith polemic and the role of argumentative and discourse norms therein is particularly strong (pp. 68f), as is the identification of a change in legal theory from arguments between two disputants to arguments between multiple positions in what could be called a “polylectic” rather than a dialectic (p. 106). All these genres had been concerned with language, but Karabela sees a change coming: “Arabic language, with its grammatical theory (uṣūl al-naḥw) became a system of thinking in fields from jurisprudence to Qur’ān exegesis, just as, conversely, a system of thinking (Greek dialectical tradition) – consciously or unconsciously – became another language by the tenth century” (p. 109). This is important, because Karabela needs to establish the switch away from language to dialectical thinking in the tenth century so he can read a return to language in the thirteenth. Chapter 3, “From Local Theories Towards a General Theory of Argumentation: the ādāb al-baḥth,” is the core of the thesis. From the twelfth-century onwards, the strict differentiation between genres eased and a new synthetic theory of argumentation emerged: the new phenomenon of ādāb al-baḥth. It contained a self-conscious commitment to truth (baḥth) that distinguished itself from a dialectic now understood as aiming only at victory in debate (mujādala) (pp. 100, 106-107). This brings Karabela back to that central binary with which he began the dissertation: the distinction between looking to win and looking to discover. The new ādāb al-baḥth equated its processes with logic and claimed to be the core mode of intellectual enquiry and the “final arbitrator” (p. 108). This was the project of Samarqandī in the thirteenth century: “After more than two centuries of the diffusion of argumentative discourse into theology, philosophy, law, grammar and poetry in the classical period (tenth through twelfth centuries), Samarqandī claimed to have discovered the science of ‘ādāb al-baḥth’” (p. 118). Karabela analyses Samarqandī’s theory in detail and then tracks it through subsequent iterations from the fourteenth to the eighteenth centuries. In a typically astute aside, he notes that some of the most influential commentaries were short – “shorter than a conference abstract” (p. 142). In a typically effective methodological strategy, he structures his analysis of the shortest treatise around the couplet with which it concludes, addressing the genealogy, authorship, controversy, and afterlife of these two lines of poetry. He is exactly right to work in this fashion; his work mirrors the dynamics of the mediaeval scholarship itself and consequently he follows the right leads without ever abandoning his critical perspective (pp. 143f). In Chapter 4, Karabela analyses five further topics: the shifts that occur around the twelfth and thirteenth centuries, dialectical forms in Ottoman Turkish poetry, similarities and differences between the Latin ars disputandi and the ādāb al-baḥth, Goethe’s knowledge of ādāb al-baḥth, and the Ottoman debate over poetry and truth. With the question of truth, Karabela returns again to the central binary with which his thesis began; there is argumentation that aims at truth, and argumentation that aims to defeat an opponent. The authors Karabela works with are sensitive to this dynamic, and it infuses his discussions of their commentaries. Karabela has also raised the crucial point of whether all logical demonstration is in fact dialectical, which takes him back nicely to Aristotle’s Topics (p. 182), G.E.L. Owen’s reading of Aristotle’s logic as fundamentally dialectical (p. 165), and the exact form of the questions asked in Arabic (p. 183). The fourteenth-century shift back to language that Karabela identifies, the “linguistic turn,” is a matter of a renewed focus on definitions, which inevitably means a focus on the meanings of words (p. 190f). New theories re-describe this focus; for Saçaklızâde definition can be understood best with the centuries-old binary of conception (taṣawwur) and assent (taṣdīq), in which definition is the former (p. 178f). When the new argumentative theory of ādāb al-baḥth starts to ask the question “what” at the start of the process more than it asks “whether p or q” during the process, then we are back to queries about essence. Does this make ādāb al-baḥth more of a science than an argument (p. 183)? Or, conversely, is the self-conscious “search for truth” that defines ādāb al-baḥth just a rhetoric that conceals polemic (p. 214f)? This is a dissertation about questions, answers, and disagreements – and the processes by which all of these were managed, regulated, and self-consciously reflected upon. It tells us a tremendous amount about intellectual history. It also contributes to a growing focus in our field on intellectual methodologies, the nitty-gritty of the history of ideas. Detailed work is being done on legal theory by David Vishanoff, Joe Lowry, and Ahmed El-Shamsy, work on the “post-classical” period is being done by Khaled El-Rouayheb, Rob Wisnovsky, Thomas Bauer, and others, and Karabela’s focus on post-twelfth-century dialectic is a serious contribution to their efforts in these thematic and chronological directions. 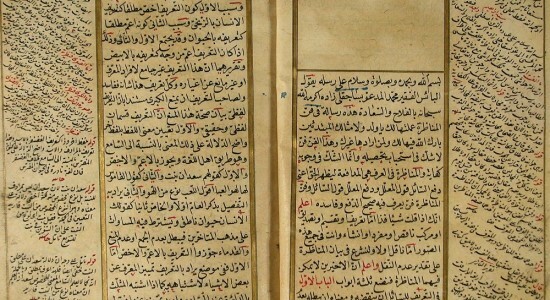 The major achievement of this dissertation is to present us with analysis of both the methodological innovations of “post-classical” authors such as Samarqandī and Saçaklızâde, and a new (autochthonous and reliable) vocabulary for reading Islamic intellectual history. As the author states: “I see dialectic (represented by adab al-jadal) and demonstration (represented by ādāb al-baḥth) as tools for interpreting the whole of Islamic intellectual history, since they refer not only to a significant feature of that history, but also to a feature that poses problems in the interpretation of that history” (p. 253). Topkapı Sultan Ahmed III Library, Istanbul, Turkey. McGill University. 2011. 302 pp. Primary Advisor: Eric Ormsby. Image: Photograph by Mehmet Karabela.